This single vineyard Chardonnay from Napa is named after the native Su’skol people who used the site as a meeting place and valued the nearby sources of fish and game. It's a vineyard that benefits greatly from it's close proximity to the San Francisco Bay, with its marine influences of morning fog and afternoon breezes. The wine is barrel aged in French oak (30% new) and is a relatively large production at 24,150 cases. It's only the fourth vintage of this wine being made from fruit sourced exclusively from this vineyard. On the nose I get baked apple, Asian pear, lemon, mandarin orange, and pineapple. There is also secondary notes of caramel ,oak, and buttered toast. On the palate I get a great initial attack of sharp acid and citrus notes followed by mid-palate flavors of baked apple pie and buttered toast. There is good weight and texture with this wine and pretty big alcohol as well, but it's well integrated with the flavor complex. 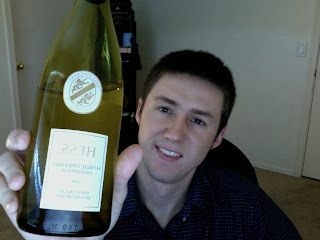 The wine finishes with medium to long length and I get flavors of creamy and buttery pear and apple.